Completely Crazy is probably best known currently as "the former Mundelein cast." Many of the cast do date back to the Mundelein days, and some date back to the mid-eighties at the 400 Theater (now the Village North), the Celluloid Jam at the Oriental Theater in Milwaukee (a 150-mile commute!) and the late seventies and early eighties at the Biograph and Prospect theaters. Members helped organize the Chicago con in the late eighties at which Richard O'Brien debuted the Transylvanian Pledge and Anthem. Members performed for the Fox Rocky Horror TV premiere and the 20th Anniversary, and have won costume contests ranging from Mike Hess's 5-state mini-con in the mid-80s to the more recent Vegas, NYC and 20th Anniversary conventions. 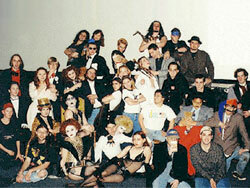 The group of 40-some people includes a Trannie corps; security, props and light crews; and a cast photographer. We are a well-rounded group of performers, with several members who are comfortable playing a number of roles (including odd combinations like Brad/Frank and Frank/Janet, as well as at least one performer who knows all of them). Fans of the national Rocky Horror scene will recognize Gene Chiovari, a nationally known Frank/MC who runs the pre-show, and Fred Olderr, a (female!) Riff who has been involved in Rocky Horror since 1980 and sports not only the BOSS tattoo, but Richard's signature and a picture of Mephistopheles Smith on her body (among other things). Special shows range from Audience Night (where the cast is auctioned off instead of the virgins) to 80s Glam Rock Night, and the cast performs live musical numbers (ranging from mostly improv to fully choreographed) every week. Occasionally the cast gets carried away, as they did at their Heavy Metal Halloween show st the Mundelein, which not only had a live band but a fire-eater. The pre-show is graced by a live audio link with the Prince of Darkness ("Mr. S."), who favors the audience with a personal style of harassment and his disturbing collection of musical oddities (William Shatner, anyone?). Completely Crazy is the only floorshow cast to have released their own Rocky Horror soundtrack LP (mostly recorded in someone's bathroom), and has an impressive array of props, including a homemade pommel horse, weight rack, a real jukebox and a 20-foot stage we made ourselves. While right now the cast is theaterless, watch for us -- you can be sure we'll be back.